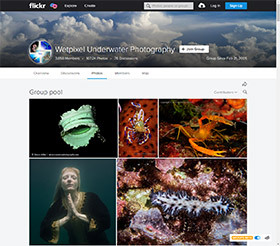 Wetpixel is the premiere community for underwater photography and videography. We have a community of over 20,000 photographers in our forums and over ten times that number in anonymous visitor. Wetpixel is often the first place people look for information about equipment and/or services. Most major underwater photography and videography equipment vendors are current sponsors of Wetpixel, and our users tell us that they use the sponsorship list and banners to see who is “active” in the industry. Wetpixel attracts over 70,000 unique viewers, 400,000 visits and 5 million page loads each month. It’s all transparent: you can see your banner statistics (# impressions, # click-throughs, and % clicks). We host our banners through Google’s ad servers. If we have unused banner ad space, we will fill it with your paid ads until the spots are filled. If you are interested in advertising with Wetpixel, please contact Adam Hanlon.